This movie is about a couple who is about to get married at a church. The pastor at the church, Reverend Frank, informs them that they have to go through a mandatory pre-wedding course to find out if they are suitable to get married. When questioned, he rephrased it as it is advisable to go through the course, and his young assistant says that this means that they have no choice but to comply. The pastor takes them through a series of tests as well as going to the extend of bugging their apartment to hear what they are saying. After going through the tests, the two of them find out that they have plenty to know more about each other and that the other wasn’t living up to expectations. Will they eventually get together and get married? This movie is a light hearted romantic comedy which makes one realize that there are many things that couples expect of each other but don’t say, and more often than not it ends up in a quarrel. Sometimes we should just take a step back and review ourselves and we might realize that we have actually gone too far in our expectations. We should keep on reaffirming why we love each other and make things work out. The main theme of the movie is actually about communications and why it is important. If you have the cash and you would like to enjoy some 1.5hours of light hearted moments with your girlfriend, watch Licence to Wed. However if you are looking for some serious plot or blockbuster, you may be checking at the wrong genre. 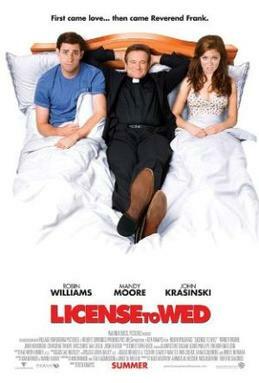 Try “Licence to Wed”. 3.5 stars / 5 stars. Posted on August 25, 2007 by ignorantsoup	This entry was posted in Movies. Bookmark the permalink. Haha..not everything we watch is the same one ba..aniwae i realize that nobody really likes reading such reviews..haha..they like other stuff better..